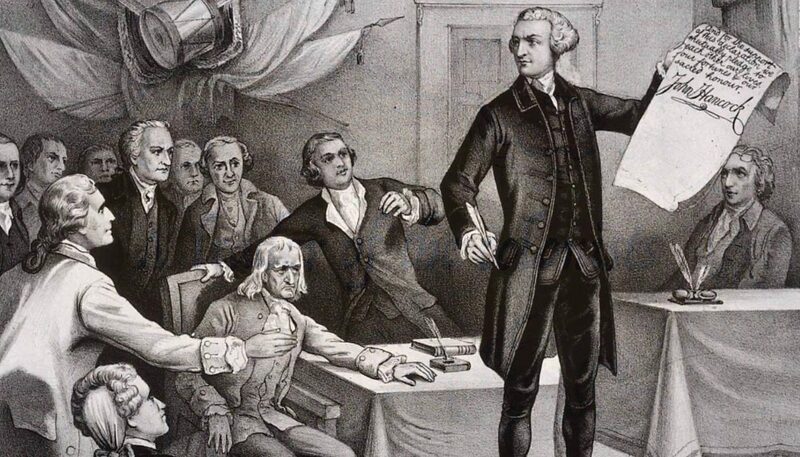 John Hancock signs the Declaration of Independence in 1776. DOUBLE OOPS! – Retired Air Force pilot Ronald Franco talks about his experiences in the space simulation habitat at the Johnson Space Center in Houston is at 7 tonight, not Thursday, in the Lutheran Church of the Messiah Fellowship Hall, 915 Oneida St., Lewiston. The talk by Amy Betros from St. Luke’s Mission of Mercy also is at 7 tonight, not Tuesday, in First Presbyterian Church, 149 Broad St., City of Tonawanda. PASTA PATROL – Vietnam Veterans of America Chapter 77 is hosting a Spaghetti Night from 4 to 7 p.m. Thursday in the Tonawanda Senior Center, 37 Main St., City of Tonawanda. Tickets are $7 adults, $5 kids under 12. MARK THE DATE – Friday is the deadline for reservations for the UB Women’s Club Dinner and Wine Pairing at 6 p.m. Feb. 1. The six-course dinner, featuring French wines and cuisine, will be held in the Fairdale Banquet Center, 672 Wehrle Drive, Amherst. Cost is $65. For more info, email Debbie Berger at d-berger3@roadrunner.com or visit ubwp.buffalo.edu/ubwomensclub. SWINGING SOIREE – Student musicians from five public and private schools will perform in Mount St. Mary Academy’s fourth annual “A Night of Jazz” at 6:30 p.m. Saturday in Bachetti by Rizzo, 550 North French Road, Getzville. The ensemble from St. Joseph’s Collegiate Institute will appear in the show for the first time, joining groups from Mount St. Mary Academy, Sweet Home High School, Amherst High School and St. Francis High School. Tickets are $8 and are available at the door. Doors open at 5:30 p.m. Mount St. Mary band director John Hathaway advises early arrival, since the show sells out. For more info, call Hathaway at 877-1358, ext. 416, or 689-1100. JUST FOR LAUGHS – Comedy Sportz Improv returns to Lockport Alliance Church, 555 Davison Road, Lockport, with a night of family-friendly humor at 6 p.m. Sunday. Doors open at 5:30. Tickets are $5 at the door. All are welcome. For info, call Tom Grzebinski at 940-3560. HAPPY BIRTHDAY – Lucia Sleight, Geraldine Goodwin, Joseph S. Brown, Christopher Andreana, Annemarie Franczyk, Joan Plewinski, Jesse Renaud, Donna Manquen, Angela LoPinto, Cheryl Palermo, Don Bills, Robbie Lattimore, Jane Domagala, David N. Perrelli, Kimberly Peters Januszkiewicz, Mary Jane Clark-Wolentarski, Matt Sherry, Alexandrea Zugay and Owen Alan Wade. The online edition of Reporters’ Notebook frequently contains items that are trimmed from the print edition, or appear there in shorter form, due to space limitations. When space permits, Reporters’ Notebook welcomes the opportunity to share light verse on everyday topics, providing that the poems are short, 12 to 16 lines maximum.